Kilo is brand that has been making big waves in the vaping industry as of late due to their new product that’s definitely catching the attention of consumers. However, that doesn’t mean the brand is exactly new to the market. In fact, Kilo E-Liquids has been around since 2014 and became a heavily reputable brand due to its artistry when it comes to flavor crafting. Expanding the brand, they now offer the Kilo 1K Vape Pod Starter Kit, which is a popular all-in-one pod system. The Kilo 1K Vape Pod Starter Kit features an extraordinary sleek, slender, and simplistic design that’s available in Black, Patriot Blue, and Spur Red finish options. It offers a plug-and-play ecosystem with a proprietary gold-plated magnetic connection. While it boasts a very compact design, the Kilo 1K Vape Pod offers an integrated 350mAh rechargeable battery, which can be charged via the equipped micro-USB port. To monitor the battery level, there is an LED light battery indicator on the device for clear indication of the battery’s current state. With a decently sized battery capacity, the Kilo 1K Vape Pod has a voltage based output, where the performance is based on the current state of the battery. Additionally, a temperature control system is integrated into the device, and draw-activated firing is in place for your convenience. At the top of the device, there’s a 1.5ML pre-filled cartridge, which doesn’t come included with the kit. 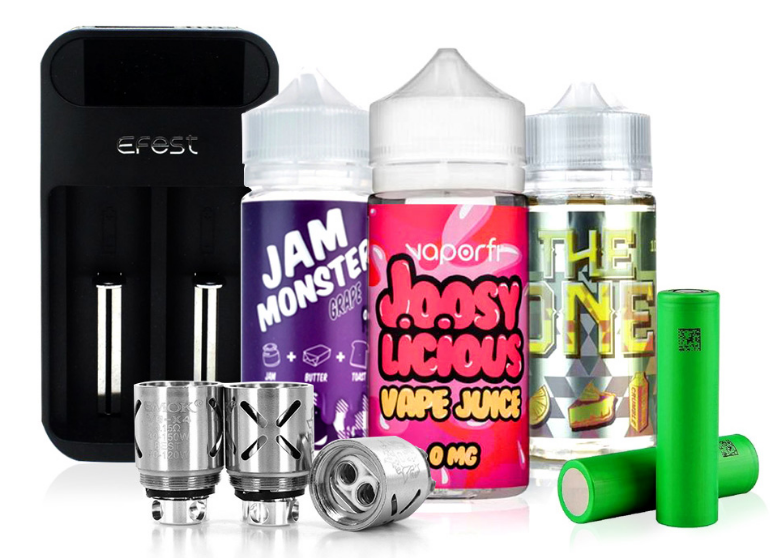 The pods that are available consist of Dewberry Fruit, Strawberry, Lemon Berry Ice, Menthol Tobacco, Smooth Tobacco, and Nutty. Helped me get off cigarettes. Easy to use and a great selection of flavors, with a fantastic hit. The battery life is also better than other similar pod devices I tried. Okay I have been smoking for over 30 years, and I know it is terrible for my health. Many years ago I tried the blu when they first came out. Weak Sauce, no way did it measure to a real cig. Then after realizing technology has changed and seeing coworkers, vaping, I said let me give it another shot... My best move ever.... The 1 Kilo just arrived today, and I got the Menthol to go with it.... WOW....It was a powerful rush, and I immediately trashed my tobacco products. I do not do reviews, but this Vape Pod WORKS.....now to try the different highly recommended flavors...So far so good, you cant go wrong with this one !!! Best of Luck !!! I’m really impressed with the flavor I get with this kit. Kilo did a really good job.